I’m usually very good at following “indulge in moderation.” Usually. Unless granola is involved. Then I can finish an entire batch faster than you can find enough things to put it in/on (umm, your hand, obvious choice). This batch didn’t stand a chance in our house, especially considering one of us is pregnant and the other is a fitness machine and blows through carbs in his sleep. I think 1/4 of the batch was already gone by the time I finished photographing it. The truth is, homemade granola is just so damn good it really is hard to stop munching on it. Especially when it’s sitting in such a cute little container in your kitchen, calling your name every single time you walk past it. And then if you count the different ways you can eat it, it becomes acceptable for any time of the day. With yogurt? 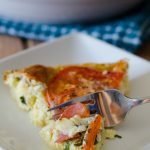 Breakfast or mid-morning snack. In your hand? 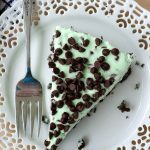 Dessert after lunch or dinner. With milk? Night cap. And then more in your hand, for good measure, when you get up in the middle of the night and can’t go back to sleep, thanks to pregsomnia. I’m going to miss being pregnant for so many reasons. Ok, let’s get back on track. 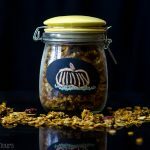 This homemade granola was born in my brain when I came across some coconut palm syrup (favorite brand: Wholesome!) and figured that I could combat the weird, rainy, cold weather that this April/May has brought to Pennsylvania with something a little tropical. Side note: get it together, east coast. It’s supposed to be sunshine and butterflies right now. Enough with the precipitation! Coconut and pineapple and macadamia nuts and visions of umbrella drinks and sunglasses and flip-flops. How does that sound? 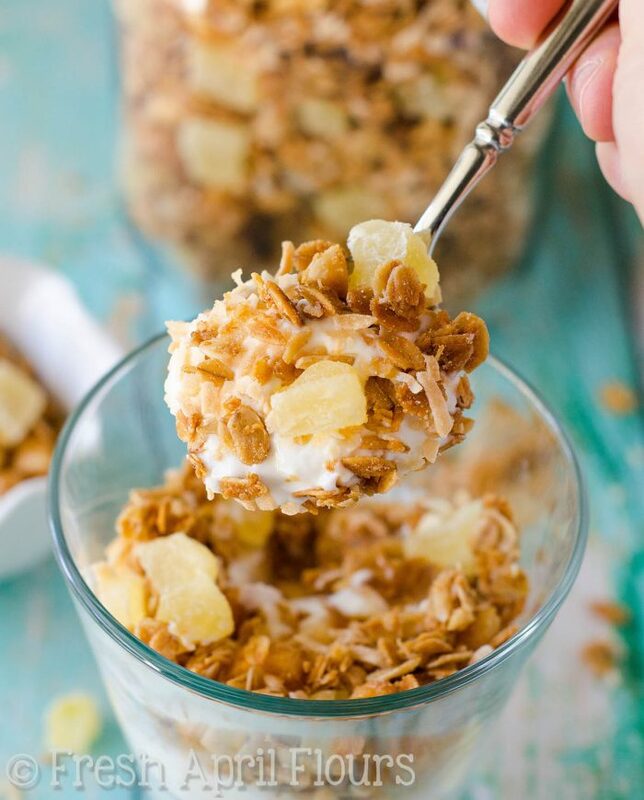 If it sounds amazing to you, you’re going to adore this piña colada granola. So without getting the song stuck in your head, serious question: do you like piña coladas? I am not one to grab a cocktail (unless it’s a G&T), but I do love me some piña colada flavored things. 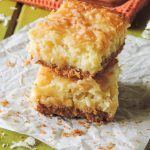 In fact, I made these piña colada bars 2 years ago that are prettyyyyy popular on Pinterest and I also have a piña colada puppy chow flavor in my cookbook. If you ask me, I’ll tell you: it’s my favorite flavor in the whole book! 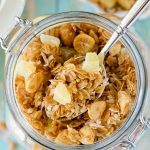 This granola is no different from those other two favorite desserts: the mix of coconut and pineapple is always a good idea, and when you can combine it with toasty macadamia nuts and crunchy oats, it just makes life better. True story. If you’re a regular here, you’re familiar with how we do homemade granola. 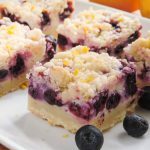 Old fashioned oats (not quick– you’ll have granola mush in a hurry), a liquid sweetener, and some sort of oil are must-haves. My favorite oil to use is coconut oil. 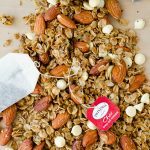 It actually doesn’t taste like coconut at all, but it sounds perfect with this granola because of all that coconut flavor going on. So, naturally, let’s choose it. The oil helps crunchify (technical term) all the goodies going on. 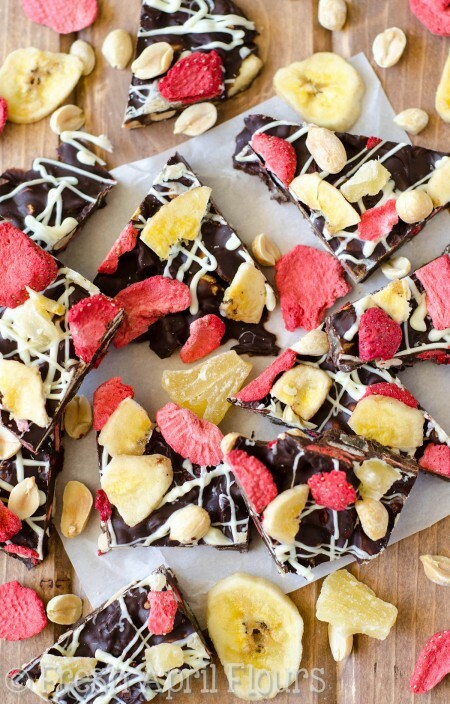 Other goodies involved: macadamia nuts, coconut flakes, and sweetened dried pineapple. 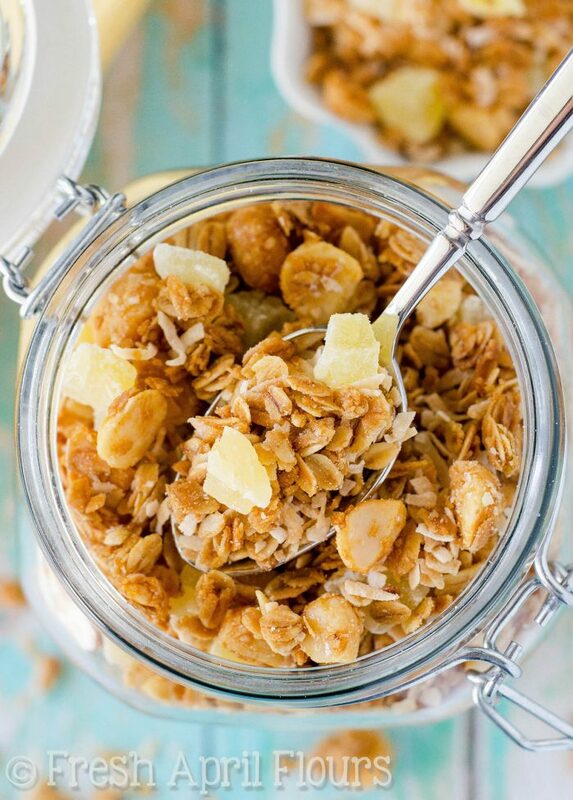 You’ll add everything to the granola in the beginning except for the coconut and the pineapple. So… Not actually everything. We don’t want the coconut spending the entire hour in the oven, otherwise we will wind up with burned coconut rather than just toasted, and I’m not sure what would happen if dried pineapple went in the oven at all, but I’m betting it wouldn’t be good. That one won’t even spend any time in the oven at all. Purely an addition after all of the granola cools. After the most excruciating wait of an hour in the oven, stirring every 15 minutes, adding the coconut for the last 30 minutes, and then waiting for the granola to cool, this snack is ridiculously tasty. 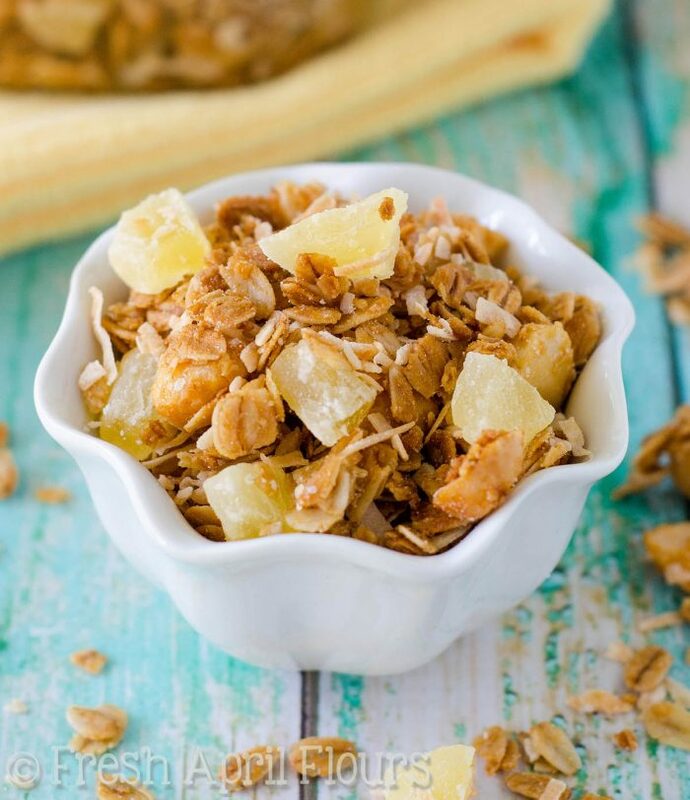 Toasty, salty macadamia nuts are the perfect complement to all the sweetness going on, and the chewy pineapple chunks make this piña colada granola texture lover’s dream. Crunchy, salty, sweet, chewy, and eliciting visions of tropical paradise and sunshiny umbrella drinks. This is truly the best snack ever. Really. 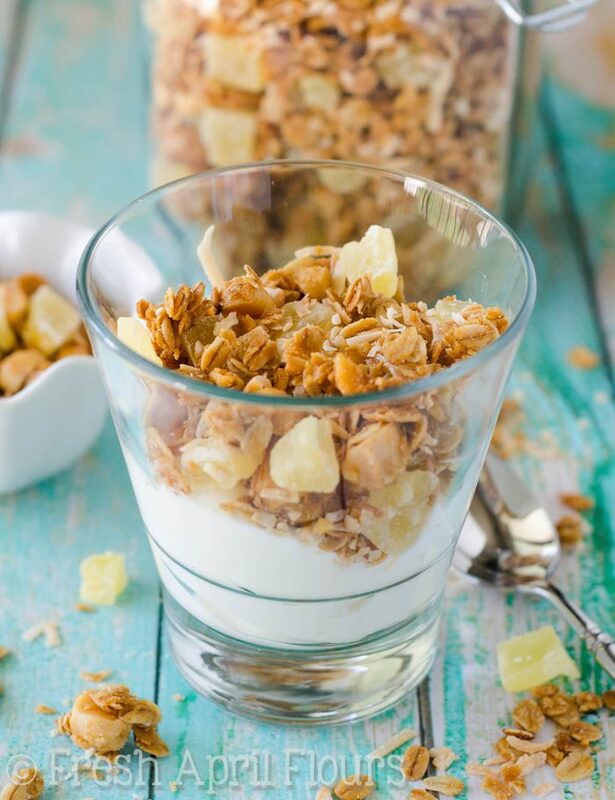 My favorite way to enjoy granola is with plain Greek yogurt. I mean, I obviously spoke earlier about straight-up-in-the-hand being a great choice, but when I throw it in some yogurt, it just goes to a whole new snack level. Plus, I get some extra protein. And that’s a snack I can get down with. 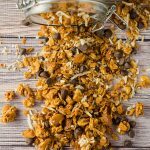 If you’re wishing some summer weather your way, I can’t see into the future, so I can’t promise it’s actually coming, but I can 100% guarantee if you make this granola, you’ll be happy and sunshiny in your mind, mouth, and belly in no time. 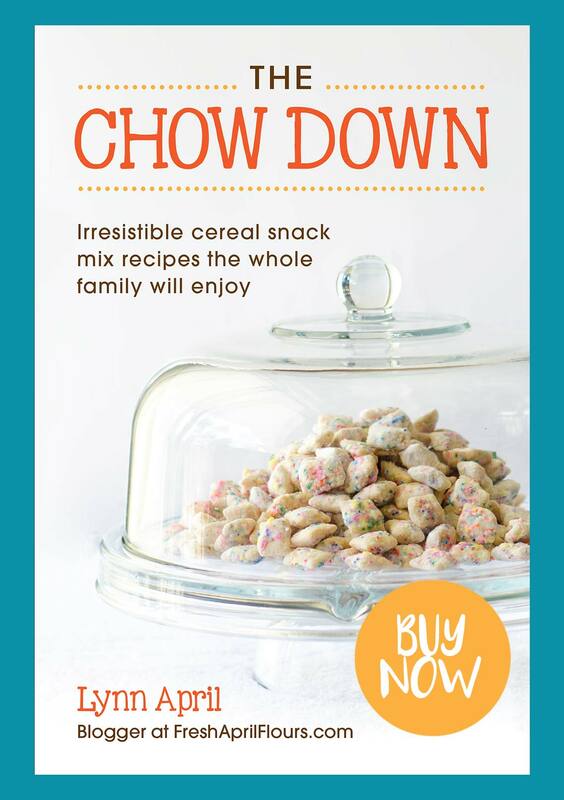 Just don’t say I didn’t warn you about its serious snackability! 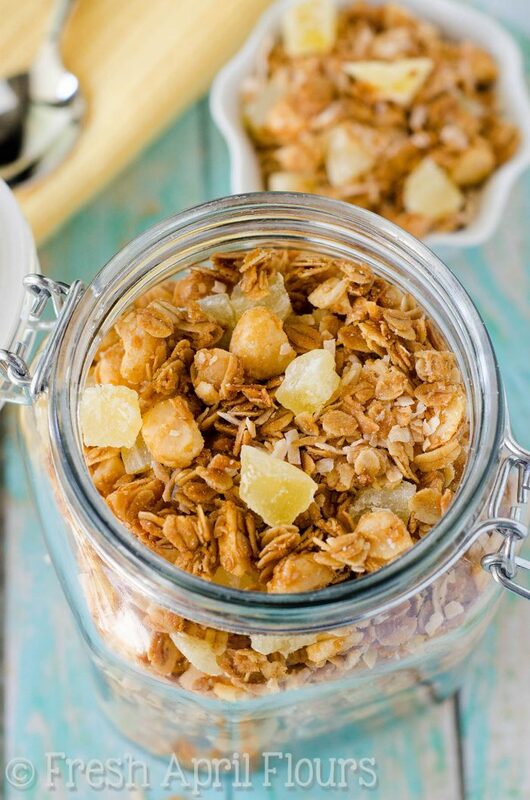 Homemade granola sweetened with coconut palm syrup and loaded with toasted coconut and macadamia nuts, and of course, pineapple! Preheat oven to 250ºF. 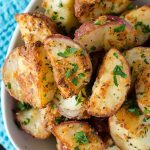 Line a baking sheet with parchment paper or a silicone baking mat. Set aside. In a large bowl, stir together the oats, chopped macadamia nuts, and salt until thoroughly combined. Set aside. In a small bowl, stir together the coconut palm syrup, melted coconut oil, and vanilla extract. Pour over oat mixture and stir well to coat everything. 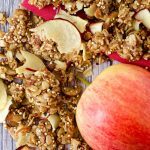 Pour granola onto baking sheet and spread out evenly over entire surface. Mixture will be very sticky. This is ok. Bake for 15 minutes, stir, bake another 15 minutes, stir again, and then add the coconut. Bake an additional 30 minutes, stirring one last time after 15 minutes. 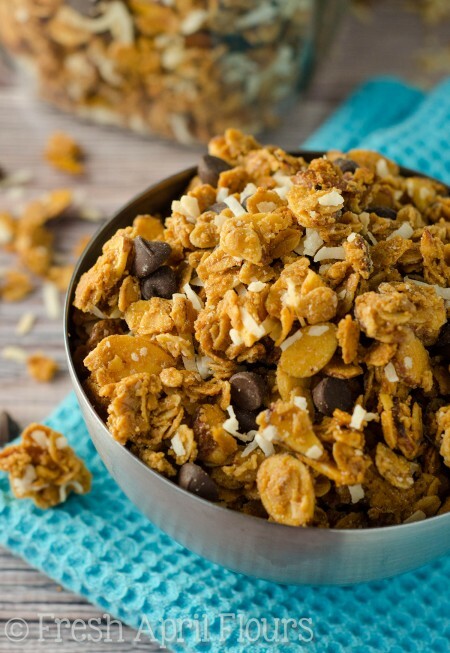 Allow granola to cool completely-- the air will help the granola crisp up. 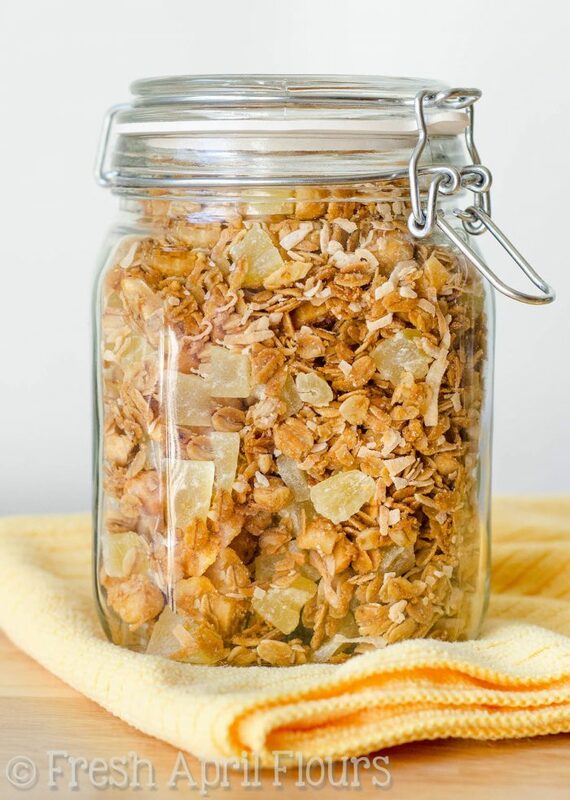 Once granola is completely cool, break up chunks (if desired), add the dried pineapple, and stir to distribute evenly. 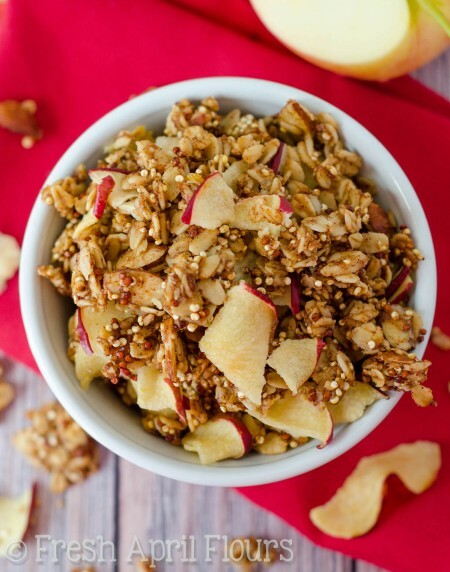 Granola will remain fresh in an airtight container at room temperature up to 3 weeks. 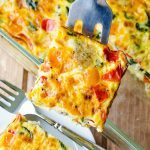 Use certified gluten-free oats to keep this recipe GF friendly! 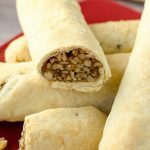 **If using unsalted macadamia nuts, increase salt to 1/2 teaspoon. 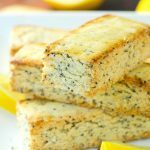 More snacks you can take on the go! Oh my word, Lynn, how delicious this sounds! I love pina coladas (sans the alcohol, of course) and pineapple and coconut anything is just…mmm. I would totally snack on this. SO GOOD. You have GOT to try this, Aria! That looks sensational Lynn! I love granola and I can understand why you lack self control around it. Usually I lack self control around anything with sprinkles or chocolate but I dont think I would be able to keep my hands out of this jar either! Thanks, Jess! You sound like Matt. He is my sprinkle vacuum. I never have as many sprinkles as I think I should because he’s usually gotten into them! High snackability factor? Check! Crunchified texture? Check! Something resembling a cocktail that I can eat at breakfast time? Check! This is definitely a winner Lynn! 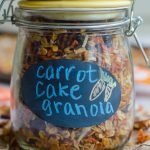 I love granola with my yoghurt in the morning so I think this one will be filling the jar soon! How long it will last, well, that’s going to the be the challenge! Haha, thank you, friend! This one was SO good. I think the salty macadamia nuts were my favorite part up against all the sweet! Yep, sounds about right!! It’s just so hard to stop with granola. Such a struggle! OH, GIRL. I am DYING over this granola right now. 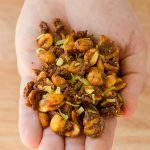 I’ve been experimenting with some tropical flavors recently, but never thought to use macadamia nuts. SO SMART! I CANNOT WAIT to try this one!!!!! YES! Granola Queen approved! 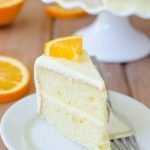 You have to try this one! We loveeeeeeed it so much!